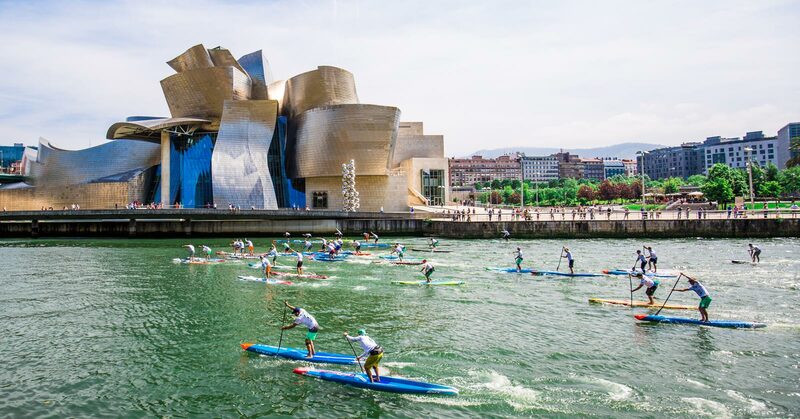 After a hectic start in front of Bilbao’s Guggenheim Museum, where several of the main contenders were boxed out by a deep field of European dark horses, Boothy soon moved to the front and controlled much of the 14km course up and down the central city river. With the pace at the front slowly but surely whittling the field down to a main group of seven and a chase group of a dozen, the podium was decided in a mad dash for the line, with Boothy avenging his infamous runner-up finish behind Connor 12 months ago to salute for the second time in 8 days and open a huge gap atop the EuroTour leaderboard. Last year’s winningest EuroTour athlete, Leo Nika, finally ended the podium dominance of the “Big Three” by sneaking in to a second place finish, one spot ahead of his Starboard team mate Connor as the red-tipped blue boards swept the top four spots courtesy of Trevor Tunnington’s impressive fourth place. Mo Freitas continues to regain his strength and looked strong in fifth, while Bruno Hasulyo was bumped down to sixth. Titou, who was likely feeling the effects of having won the EuroSUP long distance race a thousand miles away in Portugal just 24 hours earlier, repeated his 2016 Bilbao mistake of falling at the final buoy to lose any hope of winning the sprint to the line. Three minutes later, Vinni Martins led home the chase group for Team JP, with the Brazilian crossing in 8th place after recovering from a slow start to finish in fine form. The top 10 was rounded out by Fanatic duo and Italian dark horses Federico Esposito and Davide Ionico. In the women’s, the top step of the podium saw a fresh face for the first time in a month, with Olivia Piana finally getting just reward for her hard work after three-straight runner-up finishes behind Sonni Honscheid. With the field splitting early, Olivia controlled the pace and never looked back, copying Sonni’s playbook from St Maxime, Hossegor and Thonon to paddle clear and win by almost a minute from the powerful German. Once again Olivia has proved to be one of the strongest women in the sport right now. Sonni’s result is still enough to stay on top of the EuroTour rankings though, with time running out for Olivia to close the gap–although we’re only six weeks through the 11-week tour, the biggest events have already been run and the majority of points have been dispersed. Coming home third this weekend was Florida’s Seychelle Hattingh, who scores her second EuroTour podium in two weeks and moves up to third overall in the process, bumping out yesterday’s fourth-place getter, Team RRD’s Susak Molinero. The Basque Country’s promising junior prospect, Cyara Palenzuela, came home in 5th for Team F-ONE. Pablo Herrera was the stand out performer after winning the amateur division by a wide margin, while Laure Laqueche took out the women’s amateur race with a similarly-impressive showing. Arguably the most important result of the weekend went to Team Jersey, a generous bunch of nomadic paddlers from the British Channel Islands who took home the “Spirit of the Competition” award for their ever-smiling, never-say-die attitude. You can find the full results from the pro race plus points for the EuroTour and World Rankings below, with more results and plenty of photos and video over on the EuroTour Facebook page. 27 Olivier Derrieumerlou 1:30:58 1.96 France . 29 Salvador Mora Martinez 1:31:04 1.72 . .
32 Txema Landa Leceta 1:32:19 1.44 Basque . 34 Iker Barbarrubio Villasante 1:36:19 1.28 Basque . 35 Dani Espinosa 1:39:50 1.20 . .
36 Aure Medina Amorrortu 1:41:09 1.12 Basque . 37 Baptiste Nava 1:43:11 1.04 . .
38 Jean Claude Blazquez Ulloa 1:43:36 0.96 Basque . 39 Pablo Romera 1:48:00 0.88 . .
40 Enrique Arbaiza 1:53:39 0.80 . .